Bitterly cold weather hit retail sales and construction in the U.K. last month. 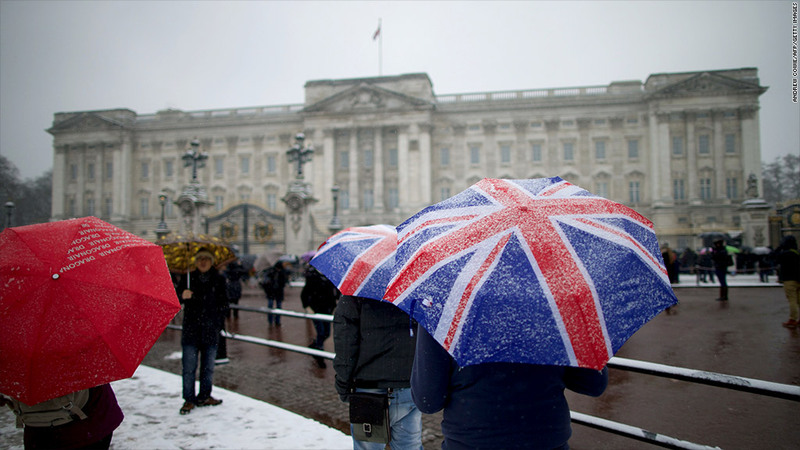 The coldest March in 50 years may have tipped the ailing U.K. economy into a third recession since the financial crisis, a result that will increase the pressure on the government to relax its policy of austerity. Most economists expect the world's sixth-largest economy to narrowly avoid a second consecutive quarter of contraction when the first estimate of first-quarter output is released on Thursday. But the chances of a surprise are high. The U.K.'s gross domestic product fell by 0.3% in the final quarter of 2012. A triple-dip recession would be unprecedented, and pile pressure on finance minister George Osborne to spread the pain of government spending cuts over a longer period of time. UBS economist Amit Kara said he expected U.K. GDP to show zero growth, but cautioned that the cold weather could spring a shock and send the economy into reverse again. "There are large risks to this forecast because of the unusually cold weather in March, and if we are wrong, and the UK economy does slip into recession once again, the triple dip will have become reality," he wrote in a research note. A recovery in the dominant services sector was likely to have been canceled out by a "weather-related" collapse in construction, noted Nomura's UK economist Philip Rush, who also expects no growth in the quarter. Retail sales were also weaker than expected in March, falling 0.7% on the previous month as British consumers, already squeezed by falling real incomes, stayed at home during the unusually cold spell. Related: Time for world to kick cheap money habit? The U.K. economy contracted for five consecutive quarters from the second quarter of 2008, and was back in recession for nine months in late 2011 and early 2012 when the eurozone debt crisis was raging. The International Monetary Fund cut its forecast for U.K. growth in 2013 by 0.3% last week citing depressed demand, and said the government should think about taking a more flexible approach to cutting the budget deficit. On Friday, Fitch Ratings downgraded U.K. debt to 'AA+' from 'AAA', citing the impact of weak growth on debt and deficit levels. In an interview with the Financial Times published Monday, bond guru Bill Gross criticized Britain and the rest of the eurozone for its efforts to cut debt rapidly. "The U.K. and almost all of Europe have erred in terms of believing that austerity, fiscal austerity in the short term, is the way to produce real growth. It is not," Gross, the founder and co-chief investment officer of Pimco, told the FT. "You've got to spend money." Finance Minister George Osborne has stuck resolutely to the path of austerity, arguing that a policy of fiscal discipline and cheap central bank money will ultimately bear fruit. A new recession would also raise the chances of further stimulus from the Bank of England, which has held interest rates at a record low of 0.5% since March 2009 and bought £375 billion of government bonds. Governor Mervyn King and two fellow members of the Bank of England's monetary policy committee were outvoted again this month when they argued in favour of extending the bond purchases by a further £25 billion. The bank last added to its bond-buying program in July 2012.